My admiration for men and women in the military is no secret. I have a particular interest in World War II, as my father was a serviceman during this period of American history. So I was surprised to learn about a branch of the military I had not thought about before, the Maritime Merchant Marines. It seems I’m not the only one to overlook this small group of servicemen. Calvin Webb, one of eight such vets from the Tooele Valley area, is doing what he can to bring attention to this unnoticed group. While our landlocked state is an unusual place to find seamen, at last count 300 Utahns are Maritime Merchant Marine World War II vets. This number includes members of the Navy Armed Guards, Webb said. 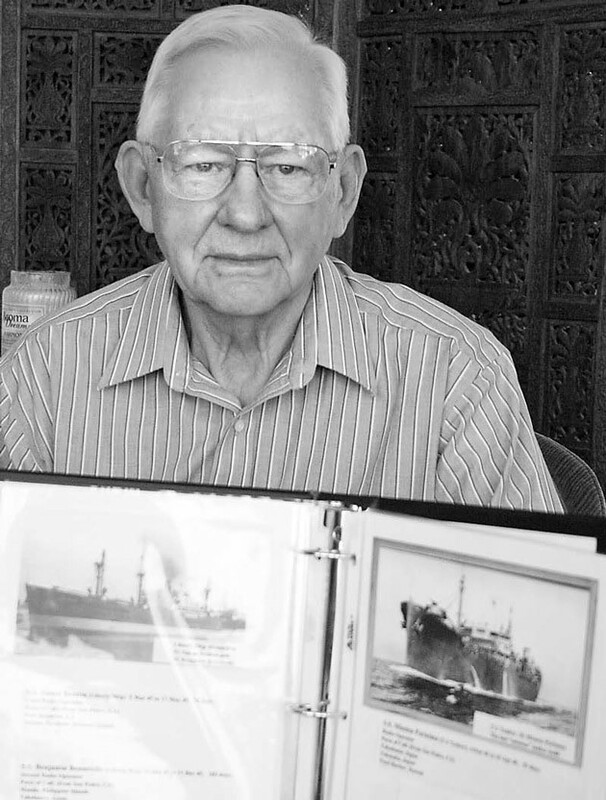 As historian for the Beehive Chapter of American Merchant Marines Maritime Service Veterans, Webb says most people just don’t think about what the Maritime Service did during the war. Merchant Marines normally are in the import/export business. However, the fleet was nationalized during World War II to ship war materials. The Maritime Merchant Marines are an auxiliary of the Navy. Mariners delivered food, mail, ammunition and airplanes to servicemen overseas. “Anything that had to move overseas had to go on ships,” he said. The one exception was some long-range bombers, which were flown from the factories to their destination by a corps of women. Veterans who served overseas arrived at their destination on troop ships operated by the Merchant Marines. They returned home on the same ships, which were sometimes ocean liners conscripted by the government for the purpose of troop movements. Like other branches of the military, many Merchant Marines paid the ultimate price. Webb said 1 in 25 members of the Maritime Merchant Marines were killed in action. By comparison, the Marines lost 1 in 34, the Army lost 1 in 48, the Navy lost 1 in 144 and the Coast Guard lost 1 in 421. Webb was 17 when Pearl Harbor was bombed, and says he remembers seeing the big headlines about the attack in The Salt Lake Tribune. A farmer’s son in Hinckley, Utah, he was able to stay home and graduate from high school and attend some college before being drafted. As he considered joining the war effort, the only two areas of heavy recruitment was the Army infantry and the Maritime Merchant Marines. Being a seaman was appealing because “I’m not sleeping in a tent,” he said. Officers on ship had the luxury of being able to wash their laundry and hang their wet clothing in the engine room where the heat dried them quickly. But the downside of being on a ship was if they were attacked there was only one place to go — in the water. Many mariners were lost when they went overboard into freezing water, so he was trained to put on rubberized suits to prevent hypothermia. He was also taught to dodge flaming oil on the surface of the water. But fortunately, he never had to use these skills. Since Webb did not join until April of 1944, he continued to serve in the post-war occupation of Japan. He says he can remember a brief stay in Yokohama, Japan where he visited Gen.
Douglas McArthur’s headquarters. While Webb served primarily in the South and Mid Pacific, mariners also served the eastern and southern coastal areas. Through his years of service, Webb saw Chili and Alaska from the deck of the ship, and many points in between. His Alaskan cruise, the last trip he took during his years of service, found him delivering supplies to fishing villages so far north they were inside the Artic Circle. Now Webb has few reminders of his days as a sailor. An elaborately carved table sits in his living room. The table is decorated with pictures of ships he served aboard. But he’s not really looking for glory, he just wants people to remember the unsung sailors in the background making sure servicemen received food for their stomachs, mail for their morale and oil and ammo to make sure their war machines run smoothly.